Background: Type II diabetes is becoming an epidemic among the population of Qatar. Patients with type II diabetes are more prone to periodontal disease. Metabolic derangement and poor quality of life are related to deterioration in the periodontal status. Objective: The aim of the current study is to estimate the prevalence of periodontal disease among patients with type II diabetes in Doha, Qatar. Study Design: This was observational cross-sectional study. 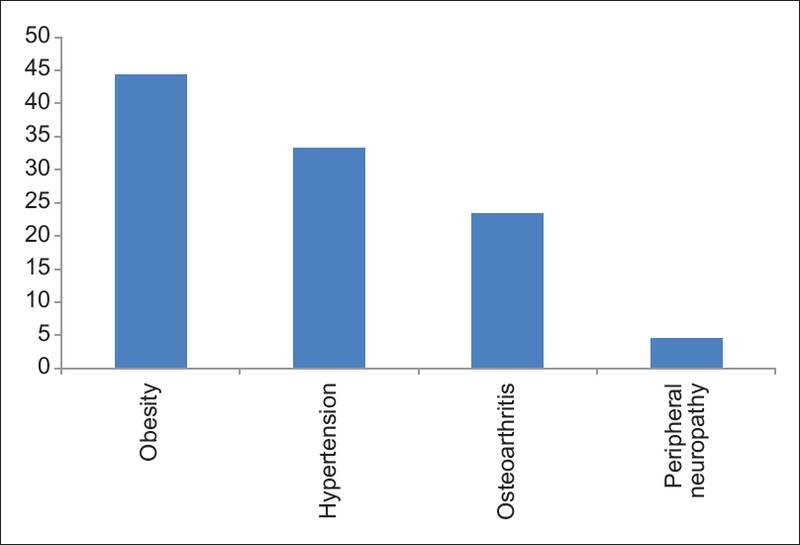 Methods: One hundred and eighty patients with II diabetes were included in the study. Data were collected from participant medical records. The dental examinations consisted of a full-mouth assessment including the number of remaining teeth, assessment of periodontal status using the decayed, missing, and filled teeth (DMFT) index: To determine the impact of dental caries on the teeth. Similarly, the World Health Organization community periodontal index was used to determine the periodontal status of the patients. Information on metabolic parameters including glycosylated hemoglobin A1C values was collected from the participants' medical files. Results: A total of 49 (36.6%) participants had periodontal pocket of 4–6 mm, more than a third 46.6 (38.3%) of the participants had one tooth missing, around 52 (29%) patients had filled teeth, more than a third 72 (40%) of the participants had poor oral hygiene, two-third 120 (66.6%) had gingivitis, 71 (39%) periodontitis, and 66 (36.6%) dental caries. 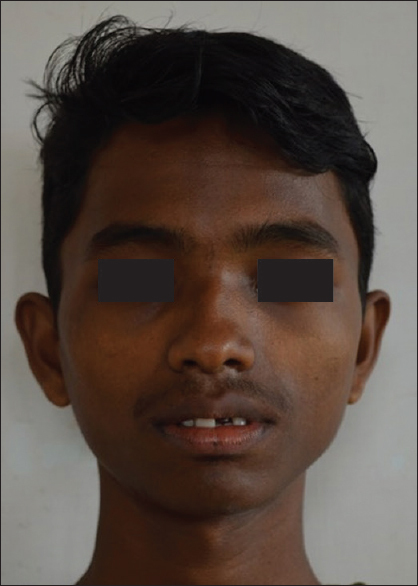 DMFT score showed that the majority of participants had decayed teeth 136 (75, 6%), 113 (63, 1%) had missing teeth, and 27 (15%) had teeth with total crown destruction. The mean DMF index was 6.3. Conclusion: Periodontitis was common among patients with type II diabetes in Qatar. Introduction: This study aims to evaluate the dentinal tubule occlusion using a desensitizing toothpaste, mouthwash, and their combination for a period of 60 days under scanning electron microscope (SEM). Materials and Methods: A total of 120 extracted premolars were collected, cleaned of gross debris, and sectioned labiolingually to obtain 60 mesial and distal surfaces. Smear layer was removed by etching the blocks in 6% citric acid for 2 min and rinsed in distilled water. The specimens were divided into four groups with a control group, mouthwash, toothpaste, and their combination groups brushed twice daily for 60 days. The sections were viewed under SEM to detect the percentage of tubule occlusion. Groups were analyzed using the Chi-square test. Results: The toothpaste group showed better tubule occlusion followed by the combination and mouthwash group (P > 0.05), but there was no statistically significant difference between all the three groups. All the groups showed complete tubule occlusion on the 28th, 45th, and 60th day. Conclusions: The dentin tubule occlusion was in the order: toothpaste group > combination group > mouthwash group. Maximum dentine tubule occlusion was found by the 28th day in all the groups. Aim: The aim of this study is to compare the effectiveness of diode laser and fluoride varnish in the treatment of dental hypersensitivity (DH). Settings and Design: Randomized control clinical trial. 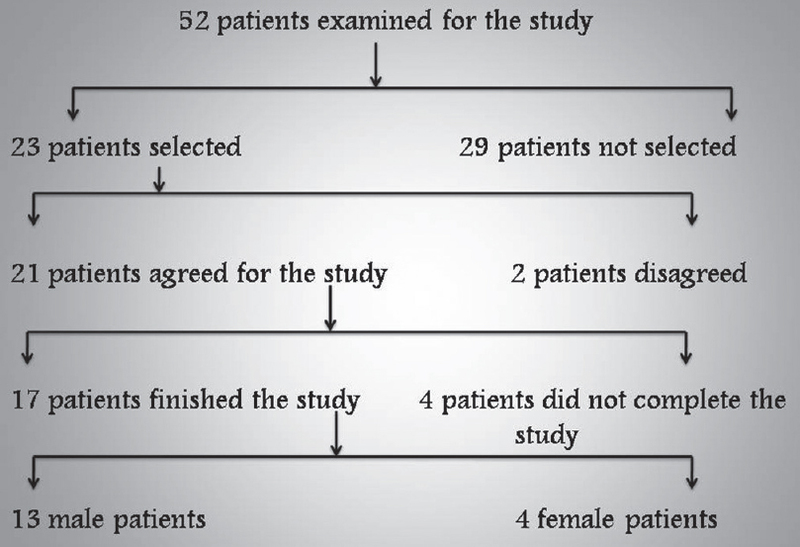 Subjects and Methods: A randomized clinical trial was done on 40 teeth selected from 17 patients. Visual analog scale (VAS) >3 from both sexes were randomly allocated into two groups: 20 teeth in diode laser group and 20 in fluoride group. Teeth were subjected to vitality testing to rule out any pulpal pathology. 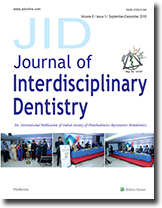 Dentine hypersensitivity was evaluated using tactile stimulus and air blast at baseline, 15, 30, and 60 days. Statistical Analysis Used: Independent student t test, ANOVA. Results: After 15 days both the treatment modalities were effective and the effectiveness was maintained all through 60 days. However, the effectiveness of fluoride varnish started reducing by the end of 60th day, whereas, diode laser shown significant effectiveness in reducing DH even at the end of 60th day. Conclusion: The diode laser and fluoride varnish, both are effective in the treatment of dentin hypersensitivity. However, over a period of 60 days, diode laser showed superior results when compared to fluoride varnish. 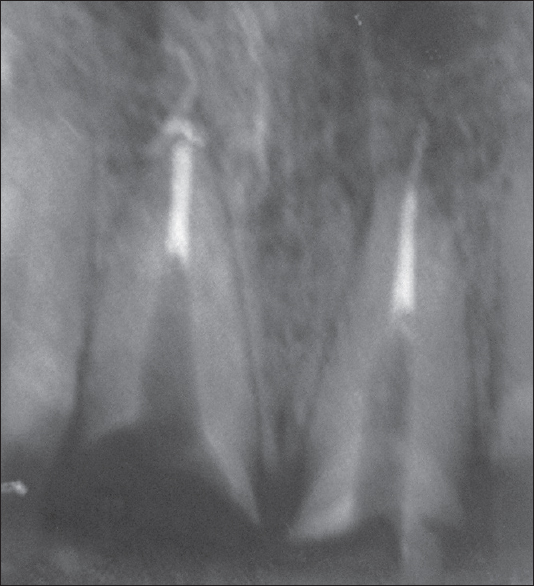 Restoration of anterior esthetic zone is a challenge to the restorative dentist. It is more challenging when it presents with insufficient tooth structure. Crown lengthening procedures or orthodontic extrusion can be employed to restore such cases. 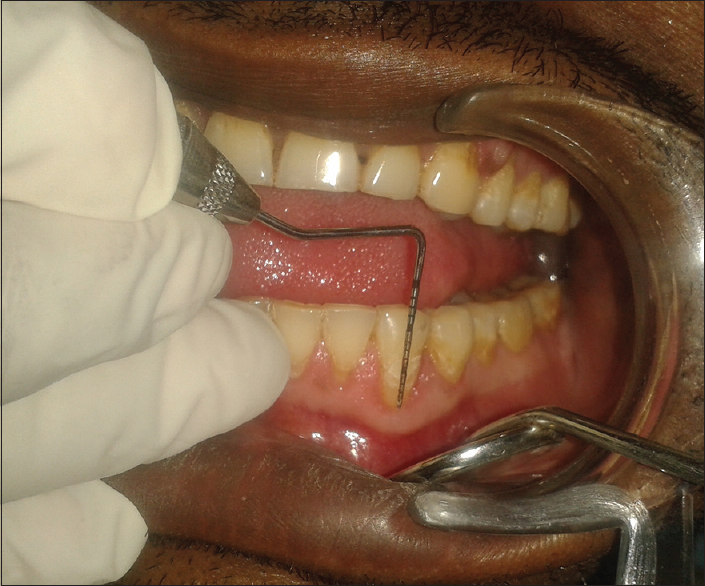 The aim of this paper is to present the rehabilitation of an anterior tooth with insufficient tooth structure in a medically compromised patient. 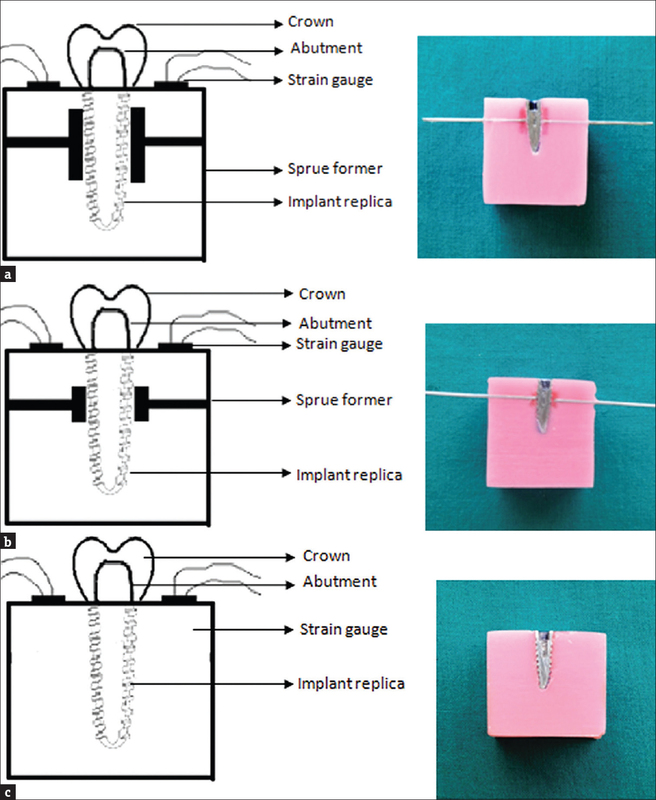 An interdisciplinary approach was employed wherein a customized cast post and core with a hook was fabricated for facilitating orthodontic extrusion. Fixed bridges and implants are often used to replace missing teeth; telescopic overdenture may be considered as another option for combining good retentive and stabilizing properties with a splinting action. The telescopic denture is a removable prosthesis that is supported by the retained teeth and the residual ridge or mucosa. 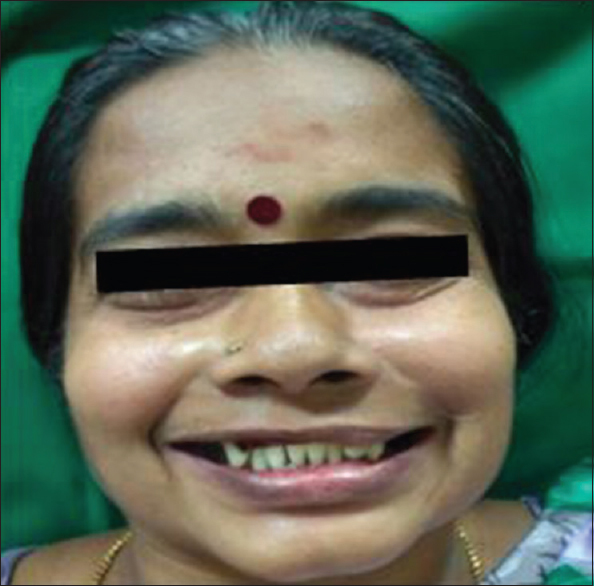 It is a versatile and successful means of achieving long-term restoration of a partially edentulous jaw. With the increasing popularity of esthetic dentistry, an understanding of the therapeutic modalities brought about by an interdisciplinary approach has developed. As a result, crown lengthening procedures have become an integral component of the esthetic armamentarium and are utilized with increasing frequency to enhance the appearance and retention of restorations placed within the esthetic zone. The present case is managed with an internal bevel gingivectomy together with bone recontouring without compromising tooth support and esthetics.